You can always tell spring is just around the corner when the cherry blossoms, or sakura in Japanese, start to appear. Romantic and feminine with their soft pretty pink petals, its no wonder they're such a popular wedding feature especially at this time of year. Credits: Model shot via Elilte Models. A stunning canopy of cherry blossom trees, the perfect setting for a spring wedding, pic unknown. Sakura kimono silk, pic unknown. Sweet sakura cookies via Wed Central. Delicious cherry blossom macaroons by Cannelle Vanille and pink blossom cake via Sasi Wedding. An amazing table setting via Martha Stewart weddings. 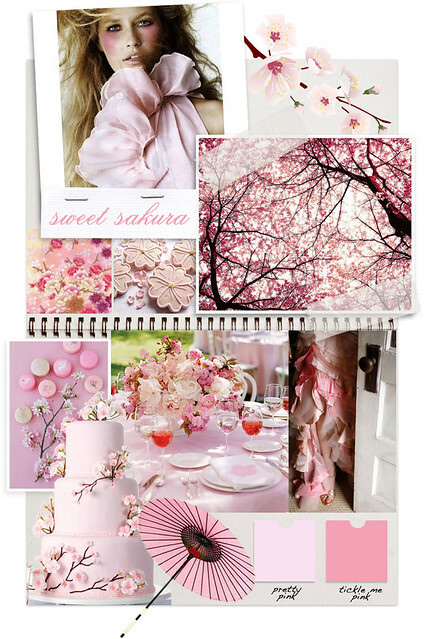 A cherry blossom wedding is the perfect excuse for pretty pink ruffles and cute pink parasol, pics unknown. I once visited Okinawa and I got the chance to see the Sakuras. They really are very pretty, looking them up close you can really appreciate their beauty and the sense of peace and love they emit. The canopy of sakuras are amazing, I went to this out door bazaar and they had this amazing canopy of sakura covering the whole area! that was a sight to behold, in fact at the motor show, they had a concept of Car Canopy made out of Sakuras! As they say, you haven't really tasted the flavor of Japan unless you have spent sometime with the Sakuras.